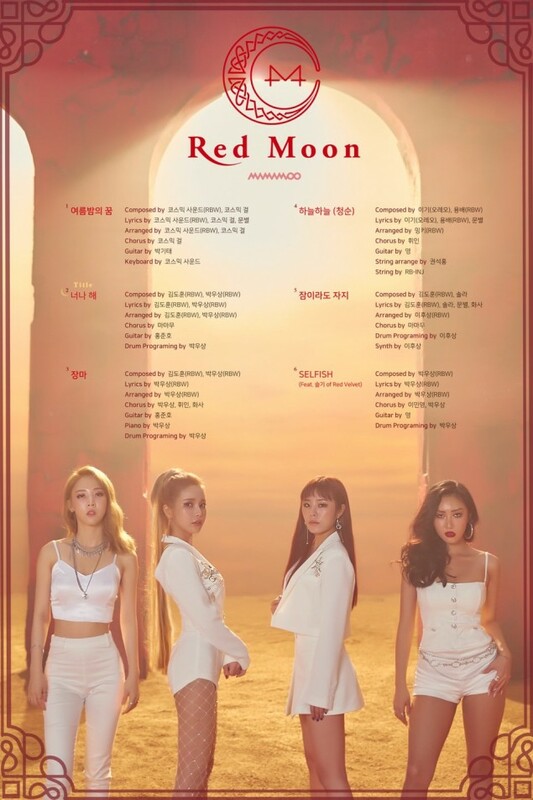 MAMAMOO dropped the official tracklist for their new album 'Red Moon'. As scheduled, MAMAMOO unveiled the tracklist for their album on July 9 KST. The new album features tracks (translated literally) "Summer Night's Dream", "You Do It" (title track), "Rainy Season", "Lightly (Pure)", "Might As Well Sleep", and "Selfish" (feat. Seulgi of Red Velvet). The track "Rainy Season" was a pre-release solo track for Moon Byul, and "Selfish" featuring Seulgi was also unveiled back in May. Are you excited for MAMAMOO's comeback? Stay tuned until its official release on July 16 at 6 PM KST!